InControl personnel developed and produced the electronics for this innovative price comparison sign for a large automobile manufacturer. 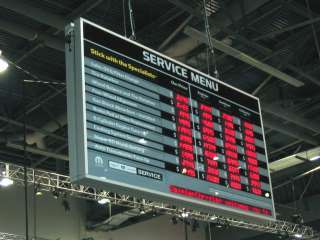 Designed for mounting in a service bay, the sign compares pricing from the dealer and three local competitors. It is a large sign, measuring 54” tall and 84” wide, and the price characters are 1.8” tall. Service jobs, as well as competitors, are manually adjustable, while all the prices are electronically updated. InControl developed and produced the unique software to update and maintain the pricing, and also performs all service and support functions on a national level. Since the sign is all modular (see images on right), we can easily tailor the design to any application you have... including internet (remote) updating.